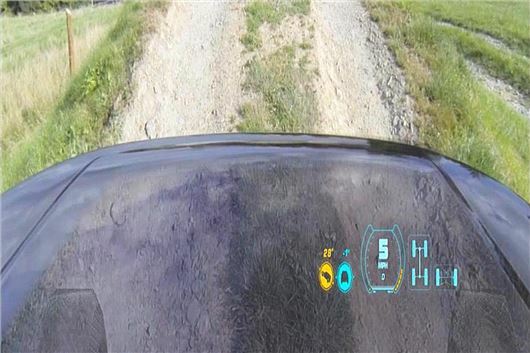 Land Rover has revealed a ‘transparent bonnet’ head up display technology, which gives a virtual image of the road beneath the bonnet of the car, allowing the driver to avoid potential hazards when driving off road or when parking. Cameras mounted in the grille of the car capture video of the road ahead and project it into the head-up display. The resulting image give the effect of having a semi-transparent bonnet, with the terrain directly in front and below the front of the car visible, along with a 3D representation of the wheels and the amount of steering lock. This gives drivers the ability to traverse rough terrain more safely, positioning the wheels with pinpoint accuracy to avoid sharp rocks or deep ruts. It would also be useful in urban environments, allowing drivers to park close to the kerb without damaging alloy wheels. The technology is to debut alongside the Discovery Vision Concept car at the New York International Auto from April 16. The Discovery Vision concept previews the styling and technology set to appear on the upcoming all-new, smaller Land Rover Discovery due in 2015. An all-new version of the full-sized Discovery is expected in 2016.